Please join GRAMMY nominated musician and activist, Rocky Dawuni, on his very first acoustic tour of Australia with stops at Mullum Music Festival, Fields of Healing Festival (both in Byron Bay) and at the Healing our Spirit Worldwide Festival in Sydney, Australia alongside an amazing array of musicians from around the world! All the festivals are focusing on cross cultural understanding, honoring indigenous leaders and creating dialogue for climate healing through creative activism. Please check festival websites for dates and times of each of Rocky’s acoustic shows featuring collaborations with local Australian musicians. 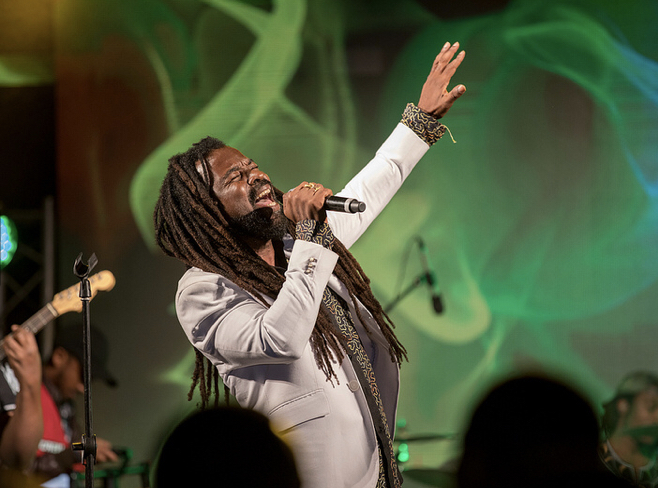 Rocky Dawuni just completed a string of elaborate performances and collaborations in India including the massive Mysuru Dasara festival at Mysore Palace and the Jhabhangadadash event in Chennai held at Nehru Stadium to a sold out audience. Recently named a UN Goodwill Ambassador for Africa, Dawuni also performed at the United Nations Headquarters in Nairobi, Kenya as well as at the UN Palace of Nations in Geneva for the World Health Organization’s (WHO) “Breathe Life” concert which was held in Geneva, Switzerland. Rocky is currently preparing to release his much anticipated 7th album entitled “Beats of Zion” in early 2019 through Six Degrees Records. His new song “Burn One” was recently featured on tastemaker radio station KCRW as their “Top Tune of the Day” and was featured on TNT’s hit TV drama “Animal Kingdom.” Another forthcoming track from the album “Let’s Go” is the theme song for Cadbury Canada’s Bicycle Factory Campaign 2018 and the beautiful 360 degree video for the song has already reached over 1 million views on You Tube.